A recent study led by Bessel van der Kolk, M.D. 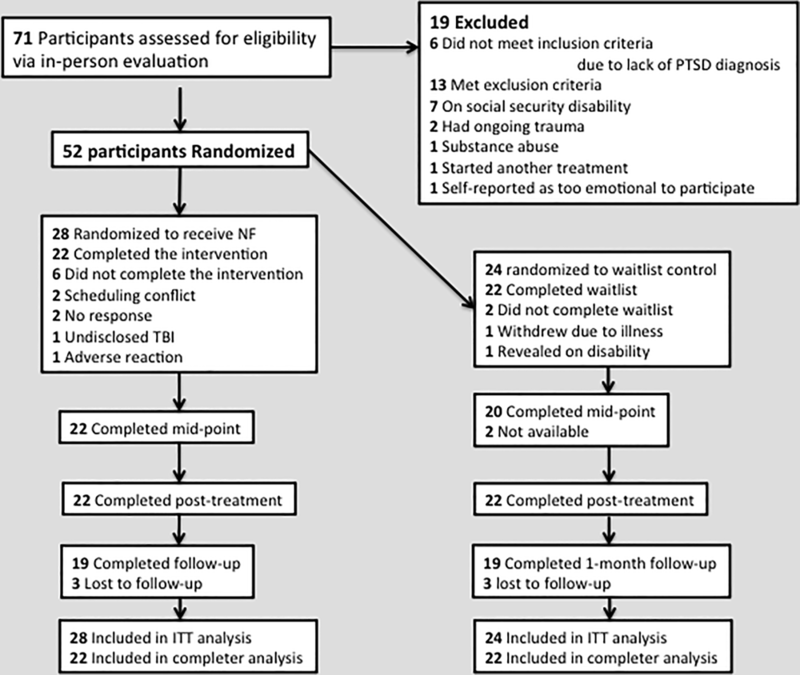 is the first randomized clinical trial on neurofeedback with a specific focus on chronic, treatment-resistant PTSD. Bessel van der Kolk is a world-renowned trauma researcher who has devoted his career to a search for effective treatment for this population. He has researched Prozac, EMDR, and yoga and discusses all of these, as well as neurofeedback, in his New York Times Science Best Seller, The Body Keeps the Score. In the randomized clinical trial of neurofeedback that he led in 2016, he demonstrates a 40% increase in executive function after 24 sessions of neurofeedback, which translates to increased capacity to modulate emotions, better cognitive function, and better judgment. All of these results have profound implications for the treatment-resistant trauma population and, given its size and the interwoven role that trauma plays in public policy, for society at large. The team at van der Kolk’s Trauma Center in Brookline, MA focused on those who were suffering chronic PTSD, excluding those with histories of brain injury and substance abuse, to explore both the impact of the treatment and the cost of implementing it. In her book, Neurofeedback in the Treatment of Developmental Trauma, Sebern Fisher supports this claim, concluding that neurofeedback is an ideal therapeutic modality for therapists to use in their private practices as well as in schools, prisons, halfway houses, and shelters. Mental health practitioners can learn how to implement neurofeedback, typically in a four day intensive, which they follow-up with mentoring. The regulatory benefits to the brain allow the patient to begin the heavy lifting of other therapeutic modalities, or as is the case for many children, not to require them at all. van der Kolk’s study fills a vital research niche. These are “the untreatable patients”, meaning those who receive only limited benefit from the treatments more widely available today. They fill our shelters, our hospitals and our prisons. Neurofeedback practitioners and patients who have experienced its benefits have been clamoring for a randomized clinical trial (the holy grail for proof of effectiveness for a treatment modality) that would stand up to the detractors of neurofeedback and to the dominant paradigm of psychopharmacology. There was a second groundbreaking neurofeedback study published in 2016. This one was led by Ruth Lanius, M.D., PhD, and in it she shows that the brains of people who have endured these histories profile differently than the brains of people who have not. Their amygdalas (the fear center of the brain) are hyper-connected to threat detection centers in the lower regions of the brain. These patients who present with dissociation are wired for threat and therefore they see threat where a healthy person would not. In the Lanius study, one session of neurofeedback showed changes in connectivity in 80% of subjects. Their amygdalas now showed beginning connectivity to the pre-frontal cortex. The prefrontal cortex is "command central" in healthy people. Both the van der Kolk and Lanius studies are landmarks in the field of trauma. Put simply: the van der Kolk study shows that neurofeedback works for trauma patients where other treatments have failed and the Lanius study shows how neurofeedback makes changes in the traumatized brain. These studies may well change the way we understand the impacts of early childhood trauma and how to treat them. For a deeper understanding of how neurofeedback and psychotherapy are integrated to treat abuse and neglect, take a look at Sebern Fisher’s book, Neurofeedback in the Treatment of Developmental Trauma and visit: www.sebernfisher.com to see vetted books written by other leading experts in this specific subset of the trauma research field.